When John Crook of Bristol University began research in the Zangskar valley of Ladakh in 1977 his prime intention was to investigate the social anthropology of the area through studies of village life. 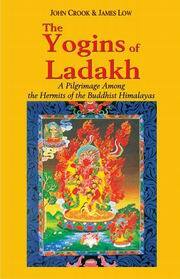 In 1986 Crook returned to Ladakh with Tibetologist James Low to enquire fully into the social organization, history, meditational practices and philosophy of the yogins who still lived and practiced in the remote parts of the area. This book is a record of the author’s adventurous journeys to meet some remarkable men. The yogins were often generous, providing accounts of their training, one of the them allowing Crook to photograph a previously unknown text-intructions on Mahamudra by the eminent Tipun Padma Chosgal. James Low’s brilliant translation of this difficult work together with that of a biography of the great woman yogin Machig Labdron provides the basis for extensive and original discussions of the meaning of Tibetan Buddhism and it’s significance in our time. John Crook, PhD. DSc a pioneer in the socio ecological study, led in 1977 a Bristol University expedition to Zangskar in Ladakh initiating a series of studies on village and monastic life in the Himalayas. During this work (Himalayan Buddhist Villages,J. Crook and H. Osmaston eds. Motilal Banarsidass and Bristol University 1994), he began studying the Psychology of yogin meditators living as hermits in the high mountains. He is the author of The Evolution of Human Consciousness (Oxford 1980), Illuminating Silence (with Chan Master Shenyen. Watkins, London 2002 and New Age Books, Delhi) and The Indigenous Psychiatry of Ladakh (in Anthropology and Medicine Vols 4 and 5 1997-1998). James Low MA. PhD works as a Consultant Psychotherapist at Guy's Hospital, London. Between 1973 and 1982 he studied Tibetan language, literature and Philosophy in India with Chimed Rigdzin Rinpoche at Visva-Bharati University, Santiniketan, W. Bengal. During that time they produced translations of over twenty ritual Texts in the Nyingmapa tradition. He continues to translate Buddhists texts and teaches Dzogchen Meditation practices. His recent publications are Simply Being (Vajra Press 1998) and Being Right Here (Snow Lion 2004).